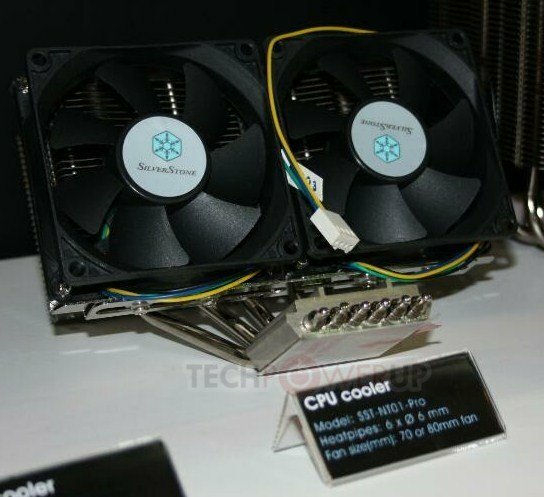 SilverStone reveals the SST-NT01 Pro CPU cooler at Computex, a new unconventional cooler with an aluminium fin stick that propagates besides the base rather than above it. While the Kuhler Flow has a square fin stack, the NT01 Pro has a rectangular one, with its longer side along the plane of the motherboard, rather than perpendicular to it. As many as six 6 mm-thick nickel-plated copper heat pipes transport heat from the base to the fin stack, which is then ventilated by two 80 mm fans.